Validating signal quality is an important part of any embedded system design. One way to determine how well your signals conform to expected signal quality is to use mask testing. A mask defines a portion, or portions, of the oscilloscope display that a signal must not enter. Whether you need to test to a well-defined telecommunication or computer standard or are interested in validating how your signals are performing compared to a known good condition, the Limit and Mask Test Application Modules for the MDO4000 and MDO3000 Series provide instant automated statistical analysis of signal quality. The Limit and Mask Test capability makes testing against telecommunication and computer industry standards easy by making mask definition quick and accurate, allowing flexible testing configurations, and providing detailed statistical test results. A common method for understanding your signal quality is to test against a known good or “golden” waveform. You can apply horizontal and vertical tolerances to the golden waveform to create a mask that can be used for quick, accurate Pass/Fail testing. This method is also a great way to perform go/no-go testing on a manufacturing line by enabling repeatable, fast decisions on the quality of a component or system. 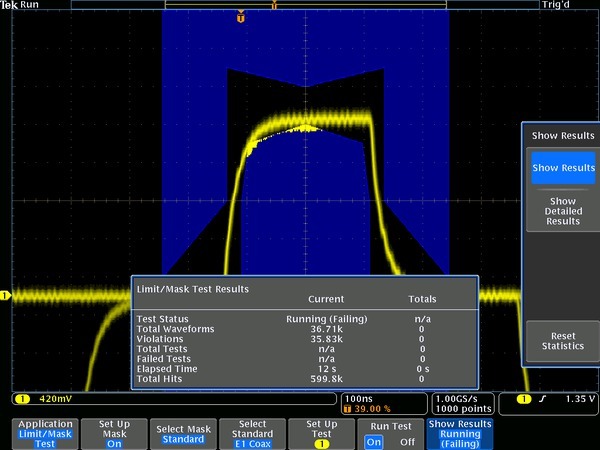 The Limit and Mask Test Application Module allows you to save your limit test mask for use later across multiple oscilloscopes in a lab or on a production line. Limit Test finds infrequent glitches and runt signals using a mask created by adding vertical and horizontal tolerances around a golden waveform. Quickly test your signals against a golden waveform and quickly gain insight into anomalous behavior. More than 40 standard telecommunications and computer industry standard masks are included with the DPO4LMT application module. Each standard mask is easily loaded from the oscilloscope internal memory and can be immediately used to conduct Pass/Fail testing. Adherence to a standard is determined pixel-by-pixel throughout the display. Masks for ITU-T up to 155 Mb/s data rates, ANSI T1.102 up to 155 Mb/s data rates, and high-speed USB 2.0 are included. USB 2.0 high-speed standard mask showing results from a mask test. In the DPO4LMT application, a robust set of telecommunications and computer industry standard masks make testing to standards quick and accurate. The Limit and Mask Test Application Module provides flexible test definitions, enabling you to tailor the test to your needs. You can run a test for a user-defined number of waveforms (up to 1,000,000) or for a user-defined amount of time (up to 48 hours), or set either criteria to infinity and run the test until you manually stop it. The Repeat Test and Pretest Delay capability enables swapping of test locations before proceeding with a test over multiple cycles of the test. You can set the number of violations that can occur before a test status is considered failed. 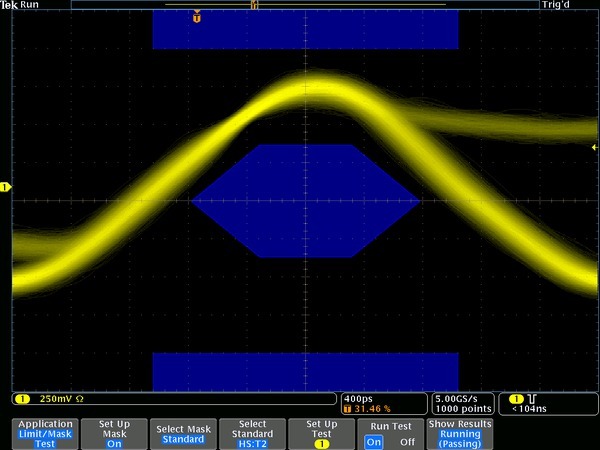 The oscilloscope can perform a number of actions when a test fails or completes. 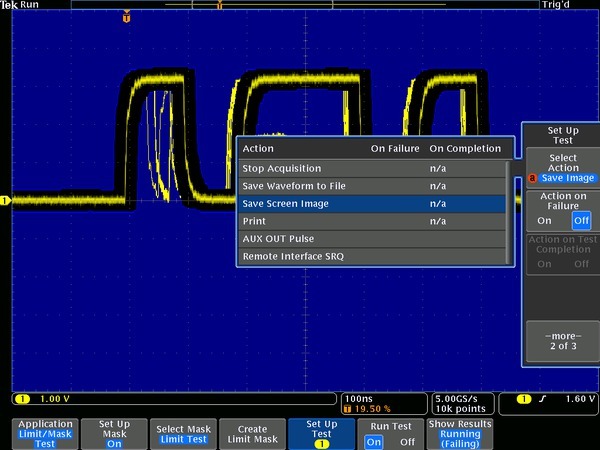 Actions the oscilloscope can perform when a test fails include stopping the acquisition, saving a screen image to file, saving a waveform to file, printing a screen image, setting a trigger out pulse, and setting a remote interface service request (SRQ). 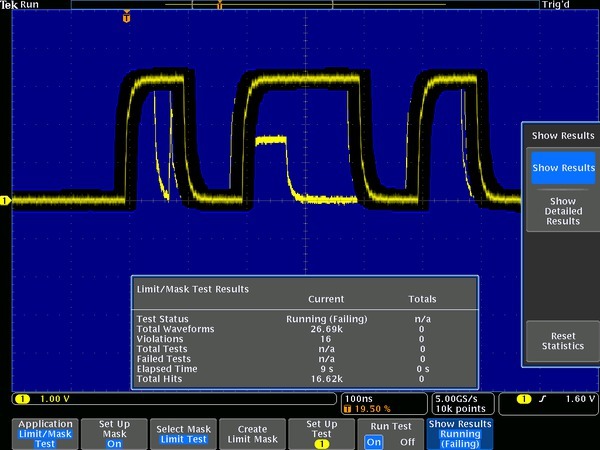 Actions the oscilloscope can perform when a test completes include setting a trigger out pulse and setting a remote interface service request (SRQ). The Limit and Mask Test Application Module enables multiple actions upon a test failure or the completion of a test, tailoring the test to your specific needs. The Limit and Mask Test Application Module provides statistical results from each test conducted. The results include Pass/Fail status of the test, number of waveforms tested, number of violations found, number of total tests run, number of tests that failed, total elapsed time, and the total number of hits within the mask. A detailed results table adds the number of hits for each mask segment enabling you to tell exactly where your signal may be operating out of intended parameters. Detailed mask test results show statistical information for the current test and accumulated over all tests. The results include information on violations, test duration, total number of hits, and the number of hits in each mask segment. A positive value spreads upper and lower segments apart, a negative value brings upper and lower segments closer together. The Limit and Mask Testing Application Module for the MDO4000 Series (DPO4LMT) or for the MDO3000 Series (MDO3LMT) enables testing against limit masks generated from "golden" waveforms and mask testing using custom user-defined masks. The DPO4LMT module also enables mask testing using standard telecommunication and computer industry masks. ≥350 MHz bandwidth models are recommended for mask testing on telecomm standards >55 Mb/s. 1 GHz bandwidth models are recommended for mask testing on high-speed (HS) USB.